The Abilene Cowgirls continued their mastery of Chapman with a 52-38 victory over the Lady Irish, Tuesday night. It was Abilene’s 20th straight win in the series. The Cowgirls won their 7th game in a row to improve to 17-2 and are undefeated NCKL Champions. More importantly, with the victory Abilene secured the #1 seed in 4A West and will play the winner of the Clearwater vs Mulvane game. The Cowboys escaped with a 46-45 victory to win their 10th straight in the series. 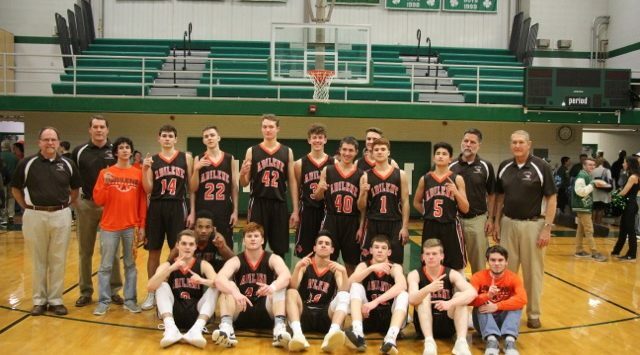 Abilene also won their 10th straight game on the season and improved to 16-3 and won the NCKL outright with a 9-1 finish. The Cowboys will be the #3 seed in the west and will host Augusta and Chapman will be the #4 seed and host Nickerson, both teams will host throughout sub-state. In the Cowgirls victory, they got another fast start from Senior, Hannah Willey. She scored 21 of her game high 24 points in the first half. She connected on 5 first half three-point shots. Abilene also got a big night from Senior, Sydney Burton, who finished with 15 of her 18 points in the second half. Abilene pulled away in the final two quarters and got up by as many as 20 points in the 4th. Chapman fell 6-14, 2-8 with the loss. The Lady Irish were led by Juniors, McKenna Kirkpatrick 15 and Ashlynn Bledsoe 13 points in the loss. The boy’s game was tight throughout. Abilene’s biggest lead was at 7 points which came in the first half and Chapman led by as many as 5 late in the 3rd quarter. The final quarter belonged to Irish Senior, Anthony Wasylk. He missed the first game with a concussion. Tuesday night, he scored 11 of his game high 19 points to keep Chapman in the game. He scored all of his team’s points in the quarter. He made a three-pointer with :55 seconds left in the game to give the Irish a 45-44 lead. Moments later he picked up his 5th foul with 40 seconds left. Cowboy Senior, James Mayden then would score the winning points on an inbound play with 35 seconds left to give Abilene the victory. The Irish out scored Abilene 18-10 in the third quarter, with most of the damage being done by Chapman Senior, Izek Jackson. He scored 8 of his 15 points in the 3rd but was held scoreless in the final quarter. Jackson was held in check by the inside combination of Seniors, Preston Boyd and Tim Barbierri. Boyd had a big second half. He scored 8 of his team high 14 points in the final two quarters, with 6 of those points coming in the 4th. Abilene also got 12 points from Junior, Travis Beetch. Abilene will wrap up the regular season Friday at Hays. Abilene swept Hays on February 12th. Chapman won’t play again until sub-state.